The upper gut includes the mouth, oesophagus, stomach, pancreas and gallbladder and the first part of the small intestine. 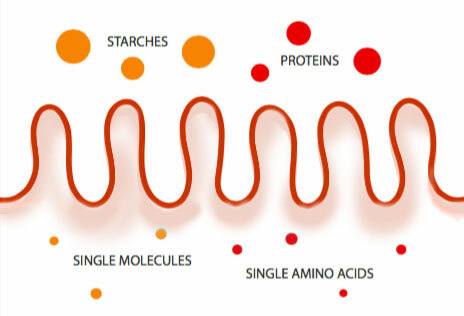 The start of protein digestion: stomach acid breaks longer protein chains into smaller, more digestible polypeptides. Adequate stomach acidity is required for proper mineral absorption. If you are chronically low in minerals like zinc, iron, or magnesium, you may actually be stomach acid deficient. Stomic acid is a natural antibiotic—it kills foodborne bugs. This is why people who are on acid blockers are more susceptible to food poisoning and “gastro bugs”! Pancreatic enzymes – these are released into the first part of the small intestine—the duodenum, when the acidity of the stomach reaches a certain pH, along with other triggers. Pancreatic amylase helps to break starches into smaller polysaccharides and disaccharides which are further broken down in the small intestine by the brush border enzymes. Protease enzymes help to break the protein chains into smaller di and tripeptides. Bile is a substance that is made by the liver and stored in the gallbladder. Your small intestine contains millions of finger-like protrusions called villi. Imagine it like a rolled up shaggy carpet. On top of the fingers are even smaller fingers called microvilli—this is the single-celled interface we have with the inside of our body and the food that comes through. The small intestine also contains 80% of our immune system. That means when undigested food particles are able to squeeze through a damaged gut wall, they come into contact with your immune system. This is how food allergies and “leaky gut” come about. The colon wall contains stretch receptors which stimulate the movement of the bowel when the stool is bulky. SIBO is a bacterial overgrowth in the small intestine that causes hydrogen, methane and/or hydrogen sulphide gas production. These gases cause the symptoms of IBS but also damage the intestinal wall. Practitioners across the nation are familiar with the frequent presentation of IBS in their clients. IBS can have several causes— food sensitivities, dysbiosis of the large intestine, lack of digestive enzymes or hydrochloric acid, stress. All can cause digestive complaints that are often indistinguishable from one another. SIBO is actually a very common undiagnosed cause of IBS (up to 84%) and thus shares some of the same presenting symptoms with IBS—Gas/bloating, diarrhoea/constipation, and abdominal cramping. We ensure you find credible SIBO treating health care practitioners all over the globe. To find one near you - head to our Practitioner page and search for a team or medical professional near you.